For years we have been delivering best collection of Designer Beds in the market. These are extremely comfortable and are easy to fit. Attractive patterns and best designs are used for its fabrication process. To add to it, our collection is very comfortable and cost effective. - Widely demanded in houses, hotels, resorts, etc. Being a well-renowned entity, we are engaged in providing a distinguished range of French Bed. Camel Bone Bed set with side table Furniture . 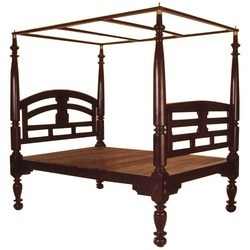 We are the leading entity of a wide range of Designer Wooden Bed. They are handmade bed from bamboo. for other products please visit our website www.artjungle.in We can customize the product as per buyer's need.